Zeboyd Games is relying on the high priest of the Great Old Ones to stay in business. Zeboyd Games' first release on Microsoft's Xbox Live Indie Games platform, the $1 Breath of Death VII: The Beginning, was a successful start for the small studio and enabled it move on to a project with a larger scope called Cthulhu Saves the World. In a candid post on the studio's blog, Zeboyd has revealed that its future may hinge on getting Cthulhu out in December and selling a very specific number of copies. 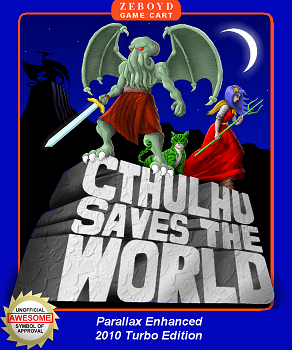 Cthulhu Saves the World will have a retro style just like Breath of Death VII, which is arguably what drew gamers to the RPG, but every aspect is reportedly getting an upgrade. In addition to a new story that focuses on a "good" Cthulhu (he won't be eating your face), the graphics, battles, and environments will look and feel even better. Making a "better" game has apparently pushed Zeboyd right to its limit. The game is part of the Indie Games Winter Uprising, where multiple developers have teamed up to show that Xbox Live Indie Games can be a lot of fun for just a dollar or three, but it's been extended from the first week of December to the entire month due to development issues. Zeboyd says that it still needs to finish a few details on the game, but time is of the essence. If it doesn't get Cthulhu out in December and sell a certain number of copies, the studio might have to stop working for a while. Zeboyd reveals that Xbox Live Indie developers will get paid in February for any sales made in the final quarter of 2010, but won't get paid until May for sales in early 2011. If Cthulhu slips to 2011, Zeboyd will likely have to start working second jobs to make ends meet, instead of working part-time in the "real world" and part-time in game development as it is now. Zeboyd also posted that Cthulhu will have to sell at least 5,000 copies for it to resume development as is, but if it sells 10,000 or more in December the studio will be in business full time. Looking back, Zeboyd would have liked to put out a smaller project before the ambitious Cthulhu Saves the World to keep revenue coming in, but is very happy with the upcoming game and says it's shaping up well. Cthulhu will be priced at $3 this time due to its upgrades and larger scope, which is still a very easy price to pay for a fun, old-school RPG. It'll be interesting to see if Zeboyd can reach its goal and make it as a full time indie studio, or if gamers will end up skipping out on its second release. I know I have my $3 ready. Is there anyone that doesn't want to play an RPG starring Cthulhu?